So you’ve bought some goats and gathered your equipment. Let’s do some milking! It can be done, but I sure looove my stand. This post has more photos of my stand if you are interested in building one like it for yourself. And check out my video on how to use a goat milking stand to get you started. My husband whipped this stand out in an afternoon. He’s pretty handy like that… It was my birthday present this year. Some girls get flowers, I get a milking stand- and I wouldn’t have it any other way! First, I put some grain in the feeder that is attached to the front of my milking stand. I also make sure that the head catch is open. The goats seem to get grumpy when they jump up on the stand and the head catch is closed. Picky goats. Here is the back of the head catch. By now, the girls are waiting at the gate and jockeying for position. Once I open the gate, one doe will make a beeline for the milking stand. If you use grain, it doesn’t take long for them to love milking time! Say hello to Cinnamon. She was our main milker this year. She hopes for a career in modeling, but I think it will be short lived. I like to keep the udders clipped- they are easier to wash and it helps prevent stray hairs from falling in your milk. I just use my horse clippers, or you could also use your husband’s hair clippers. Of course, I’ve never done that. Nope, not me. Now give the udder a thorough wash. This is where my handy “reusable baby wipes” come in. I generally use one square to do an initial “rough” wash to loosen any debris or dirt that might be clinging to the udder and then follow up with a second rag that focuses on the teats. If you are milking more than one goat, be sure to use fresh wipes for each one so you don’t pass any possible infections back and forth. Now grab your strip cup and squeeze the first 3 or 4 squirts into it. This “flushes” any dirty milk from the teat and it gives you a chance to check the milk for any abnormalities such as clumps or bloody specks that might indicate mastitis. Here is my How to Milk a Goat video with more details. I started out using one hand at a time. That way, I could hold the bucket in my other hand and keep it out of the way of any random kicks. Since my girls were first fresheners this year, it took us some time to figure each other out. However, now I can milk two-handed and it goes much faster. Once your goat’s udder is emptied, dip the teats in a teat dip solution to “seal” it up. Rub on some udder balm- I love my homemade version the best. Then take you milk into the house immediately. In order to keep your milk tasting the very best, it needs to be chilled as rapidly as possible. I have my jar and filter system waiting for me in the sink. I filter the milk, date the lid, and place into the back of my fridge (where it is the coolest). First, rinse all of your equipment in cool water. This helps to prevent any “milk stone” buildup. Next, wash everything with the hottest soapy water you can stand or run everything through the dishwasher to sterilize. Allow everything to air dry thoroughly. Bacteria likes damp environments. 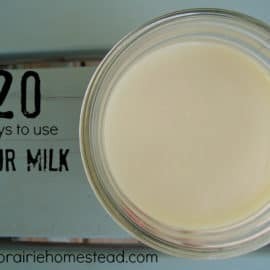 What is your milking routine? How many animals do you milk per day? Do you milk all the girls then refrigerate, or milk and refrigerate each goat? Miranda- I collect all the milk and then take it to the refrigerator. Although, if I was milking more than 2 goats and it was really hot outside, I might consider running to the house in between goats. Neat. Good to know. Can't wait til we get goats of our own – i'm sure i'll be consulting your blog even more then. I love your milk goat series! Excellent information. We are thinking about getting goats in the spring but have not made a final decision yet. Are yours all Nubians? Millie- yes, all of our girls are Nubians. How fun to be considering goats! You will have to keep me posted if you decide to get some! Thanks for the heads-up on the herdshare bill- I was not aware of it. It would sure be wonderful if herdshares were legal in WY! The more options the better! Love your goat 101 series. We just got goats, I am so excited about it. We have 2 Snubians(yearlings hoping to kid out next spring) and a Nigerian Dwarf doe with 2 kids.. We are still working on her with milking.. But we definetly love them..
I’ve kept goats for many years. I always used to strain the milk through a disposable strainer disk, but now I use a metal mesh coffee filter that I got at Walmart and it is so much easier. When the milk is in the jars, I put on the lids and put them in the freezer for two hours and then transfer them to the fridge. I think your goat series is great! Yes- I love those reusable metal strainers! I do not milk any animals. This is great info. to know. What is a teat sealer, or what do you use? To improve the rate of chill, I keep a cooler with water in it next to my frig. As soon as I come in from the barn, I set my milk tote in the water and add plastic bottles of ice that I keep in my freezer. 2 qts. of ice per gallon of warm milk is about right to get the whole tote-full down to 40 degrees in under an hour. Then the ice bottles go back in the freezer to be ready for the next milking, and the cold milk goes into the frig. The milk chills much faster in an ice water bath than just put into the frig or even freezer. See Mary Jane Toth’s book, “Goats Produce Too – the Udder Real Thing”. I bring my milk in, strain it, then put it in the fridge in a bucket of cold water that is constantly refrigerated. Then I add 6 trays of ice-cubes.That is SUPER COLD! Genral rule is 1 lb of grain for each 2 lbs of milk. In reality each goat eats at different speeds. If a goat eats to fast and I need more time to get the milking done I add alfalfa pellets to grain and this slows them down because they have to eat the grain around the handful of pellets ( they leave the pellets ). I also take into consideration the condition of the goat. I don’t like goats that look like bags of bones with skin, they should have nice shinny coats of hair. Producing milk puts alot of demands on the system and if pregnant in addition your little goats need nutrition to stay healthy. I love this… All of it. I so badly want to do it all! We have a homestead with plenty of acreage. I just need to find the time. I 3 12hour night shifts a week and my husband works as well. Finacially, this is a must right now. How do you find the time for it all? My best advice is to just choose one new thing at a time, research it, plan for it, and then work on implementing it into your schedule. You’ll have to keep me posted on your progress! It sounds like you have a wonderful start with your chickens and gardening. I’m betting you’ll really have fun adding dariy animals. And what a blessing to have your family all there to pitch in! Ruby is first freshened and she holds her milk. I can massage, sweeten her feed let her go first on the stand, in the middle or last and she won’t let it go. With patience and time on the stancion she would eventually let it down. A few weeks ago, I tried an experiment and sang to her as I milked. The milk flowed! Funny because I can’t carry a tune in a…well…a three handle (milk) bucket. Ha! I love the idea of letting the kids help you with milking, especially when you have a job! How long can they “help” for? Is it like humans – you can pretty much let them drink their mothers milk for as long as they’d like? Your website is awesome. I’m considering buying a Snubian and her doeling, just a little worried about the milking due to my job! Also I am very frugal and your ideas on milking equipment were right on! I milk 2 Lamancha sister goats. I am so jealous of how big your goats teats are. We just got 2 saanens and their teats are much smaller. The one we got first has super small teats and the 2nd one has a little larger. It was a learning curve to hand milk them considering it was my first time milking anything. Now to figure out what to do with 2 gallons of milk a day! Yes, I definitely was spoiled in that aspect! At one point we were given a Nubian with much, much smaller teats and it just about killed me to milk her.. 😉 Yay for your 2 gallons/day, though! Thanks Jenn- will look into that! 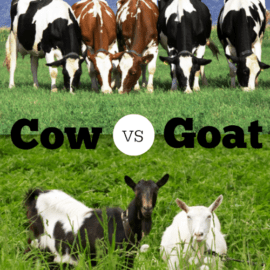 The hardest part of Goats: when you are tired- go milk, sick-go milk, want a vacation – go milk, milk in the morning, milk again in evening…..sleep milk eat care for goats sleep milk eat care for goats. If it is -10 – go milk, etc. I have a small herdshare dairy in Oregon so need to supply a consistant supply of milk to the owners. Very few realize the commitment it takes and the planning. At times it is exhausting. I have 8 milking does and milk 3-5 at a time with others pregnant, the buck and babies every few months year round. I am not even going to try to plant a garden and could use a housekeeper. It works better to trade milk for veggies from the neighbors. I don’t encourage people to own their own dairy animals because if they don’t take the commitment serious it is the animals that suffer. Each person has unique talents and they should do what they are good at and trade. As we look at the homesteading from the past it is important to realize that we have demands that our ancestor didn’t like INSURANCE…( My agent is not interested in trading for milk), so I have to generate the cash. I am not sure that it is possible to be totally self-sufficient. I do what I can but Do certianly appreciate indoor plumbing, water heaters, and cctv cameras ( for nightime baby watch ) that make life a little easier. I enjoy your blog and reading all the comments, got a real kick out of the rattlesnake discussion. I agree Linda– it is a huge committment. We are currently just milking our one cow right now, but I imagine that having a herdshare set-up would be even more strenuous. The longer that I homestead, the more I am realizing the importance of community/bartering. It is impossible for one person to do everything completely by themself! Hi, I am loving reading your site, thank you for so much good information. I currently have 4 pygmy goats, two does (one of which is pregnant, our first kidding, I am sooo nervous! ), a buck, and a wether (he was our first and is a pet more than anything else.) So my doe that is pregnant I think was pregnant when I got her, but the previous owner didn’t know, I didn’t research enough before I bought them, my mistake and I won’t make it again. But now that I have them I love them and wouldn’t trade them for anything. So anyway, she should kid in the next few weeks and I am preparing for that, but I would also like to milk her when she is done. I have heard that milking pygmy goats can be harder, but that their milk is just as good, and since that is all I have I want to try it. We will be building a milking stand this weekend and I am off in search of the other supplies today. My question is how soon after the baby(ies) is born do I start the milking process, and then if I do it only once a day to allow the kid to have it the other time, is it better to do it in the morning or in the evening? I would prefer evening because I have small children that aren’t morning people,lol! And I am guessing you don’t pasturize your milk, but if you did, for the purposes of drinking it only. Would I chill the milk first and then pasturize it or visa vera? Any help you can give would be great. I have posted on other sites but people are always so vague. Thanks in advance! I like to wait about 2 weeks after the babies are born to start milking. It allows them all to bond, and lets them have all the colustrum as well. I prefer to milk in the morning (keep them locked up all night, milk, then turn them together all day.) But, you could reverse that process if you’d prefer to milk in the evening. Either way is fine. I don’t pastuerize my milk at all– having raw milk is the main reason we have dairy animals. 🙂 As long as your goats are healthy, and you chill the milk right away, you should be fine. How long does it take to milk each goat? How much does each produce? (I’m sorry if it says somewhere and I’m missing it). It takes anywhere from about 5-15 minutes to milk each goat– depending on how much they are producings. 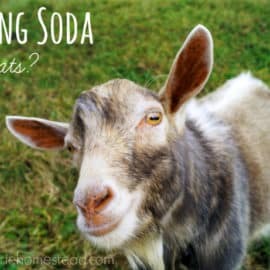 Mine usually produced about 2 quarts per milking– although some goats product much more. Fill your pail mainly with water, then at the end put a cup of vodka in it. The vodka keeps it from freezing all the way, you want a slushie. Put in freezer for morning. In the morning we scrape the slushie into a bigger pail (the bigger ones dont fit in the freezer). This pail must accomodate a gallon jar (or whatever you store your milk in). Keep the milk in it for as long as you need (never until the slushie has warmed). Great tip Haley! Thanks for sharing! Thanks for sharing your thoughts about concentrate. Hi, we are looking at getting another milking goat and milking once a day as you do. How long will the doe allow the kid/s to keep feeding off her before she tries to wean the kid/s or will she not wean the kid/s while we are milking her also. Also if we go away for a week or so it is just the kid/s feeding as we did with our last milking goat is it possible to increase her milk supply if it drops a bit with just the kid/s feeding off her, this is what happened with our last goat. Thanks for any advice on this. I recently purchased 2 milk goats and a male. Hopefully by spring we will have goat milk. I am very excited. We had goats in the past and the babies are just precious. It definitely is a commitment. God Bless You all. This might be a funny question, how do you know when your done milking? Like will the milk just stop coming out of the teat? My husband and I have recently traded in our sailboat cruising lifestyle for a farm. We currently have three pregnant Nigerian Dwarfs, one of which is due next week. We’re incredibly excited, yet apprehensive about it all at the same time. I just found your blog today and am very impressed with the amount and quality of goat information here. Thank you so very much! One quick question – how long do you wait after kidding to start ‘sharing’ the milk (we’re planning to milk once a day)? We are currently planning on waiting a month but would love to hear your thoughts. Thanks so much and we’ll be following you closely! This is truly wonderful- Thanks a ton and carry on the great work! Yep! You can definitely combine milks in the same bucket.